Sriz Beauty Blog: Happiness with Sharing The Load!!! 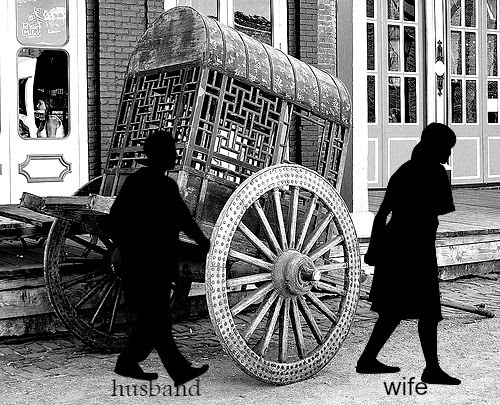 Leading a marital life is like drawing cart with two bullocks. Unless husband and wife, compared with bullocks, lead the life balanced without any ups and downs, no family finds happiness in their lives. Every human is having his/her own feelings, restrictions or conditions but while leading life with other partner he/she has to sacrifice or change his/her attitudes or feelings. Both the husband and wife should assimilate the needs of their life as well as the problems of their life. Both the life partners are interdependent and both should coordinate each other and carry the burden evenly. There should not be any uneven feeling i.e., one is carrying heavy burden and the other is carrying less burden. Sometimes wife’s burden may be more when they are visited by relations or friends. To cook and serve the relatives wife works hard but at the same time husband should also balance the burden by sharing or helping his wife in cooking, laundry and serving in addition to his bringing vegetables, eatables, etc., from the market. A couple of months back my husband took up the #WashBucketChallenge which is the second phase of the Blogger Activity by Ariel in association with Blogadda and for the first time he helped in washing the clothes and from that day onward he continued helping me in not only laundry but also in other household chores. There has been a lot of change in my life before and after #ShareTheLoad initiative by Ariel. Now my work is being shared by my better half and now we have more time to spend with each other. Before: Few months back, when this #WashBucketChallenge as well as this #ShareTheLoad concept were not there in existence, that time I am the only person to look after all the household chores including cooking, laundry, cleaning etc., I used to struggle a lot to manage both my blogging work as well as the household work, especially in the weekends. Performing incessant household work alone without being shared by my life partner I couldn't day out and couldn't enjoy our planned tour programs. After: After my Husband took up the #WashBucketChallenge and after having shared the workload by my spouse, now I am in a having enough time to enjoy and fulfill my chalked out plans and started enjoying my life with my life partner. This sense of equality within my household lead to more quality time with each other and resulted in success for the household. Any work shared by both the life partners will lead to happy and more balanced home. So #ShareTheLoad and share the love at home by sharing the household works and be a reason for Happiness, as sharing the load ultimately leads to Happiness!! !